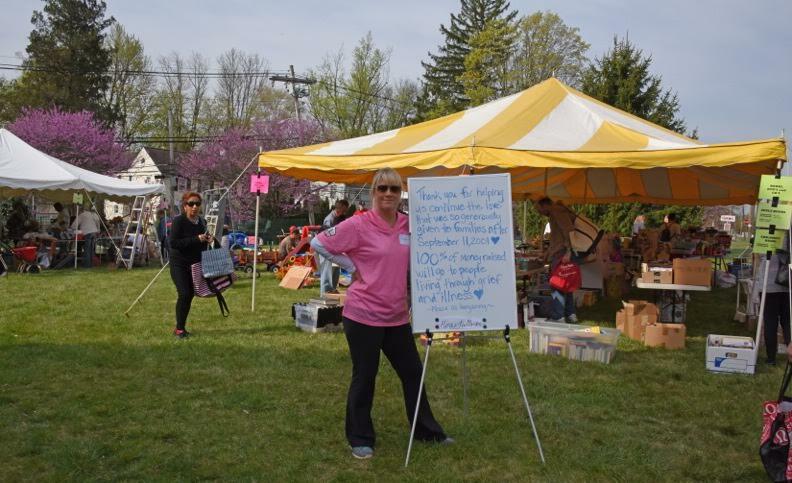 A two-day yard sale whose proceeds benefit local families was recently held in the Somerset County town of Basking Ridge, New Jersey. What’s noteworthy about this event is its connection to the 9/11 terror attacks and its ongoing mission to help families heal. The yard sale is sponsored by Heartworks, a nonprofit organization founded by Megan McDowell, a Bernardsville grief counselor whose brother-in-law was killed on 9/11. She was inspired by the outpouring of community support to the area’s grieving families in the dark days and months following the WTC attacks — the towns comprising the Somerset Hills area of New Jersey lost more than 20 residents on 9/11. Neighbors responded by offering assistance in a variety of ways, from raking leaves to delivering morning coffee. Donations came in from as far away as California, as school children sent portions of their allowances and chore money to support children who’d lost their parents. With Heartworks, McDowell carries forward the compassion and spirit that marked the aftermath of 9/11 by helping local families in need, and the yard sale is one of its fundraising events. In this political silly-season, it’s important to celebrate those values — kindness, self-sacrifice and charity — that come to the surface during times of crisis. In our practice, we’ve represented first responders whose selfless devotion to their fallen comrades put their own health and lives at risk. Many of them have benefited from the great outpouring of compassion and gratitude from their neighbors and colleagues across the country. As legal advocates for the 9/11 community, we’re thankful for the many reputable 9/11 charities that continue to do great work, because the need for assistance continues. Debilitating and even terminal 9/11-related illness is a very real threat to more than 70,000 survivors who have registered for Zadroga Act health screenings. We will continue to serve this community and hope that organizations like Heartworks will continue their healing work. Barasch & McGarry represents 9/11 survivors suffering from WTC-related illnesses. If you have questions about your rights under the Zadroga Act, call us at 888-351-9421 or contact our office online.